It’s no secret that Snapchat is THE place for millennials right now. If your targeted audience includes them and you’re not there right now, you’re missing out big time! 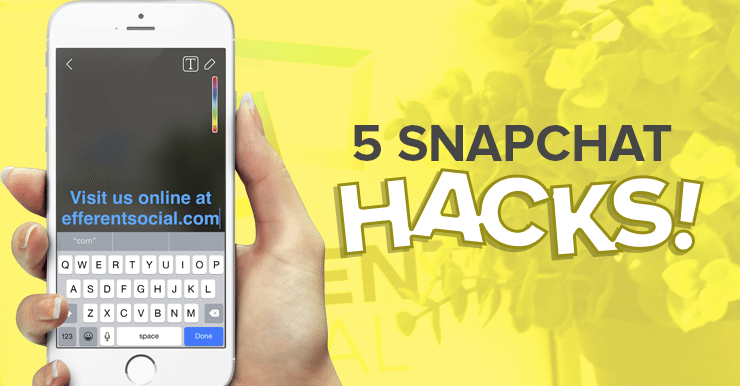 Below are five Snapchat tricks to help you build better creative content on Snapchat. Use the pencil tool in the top right corner to draw on your snaps. Pinch your finger while holding down the record button to zoom in while recording a video snap. Swipe right after you take a snap to add a filter, time stamp, weather stamp, or MPH speed stamp. Write a message on your snap and then press the text icon in the top right corner a second time to make your text larger. Once your text is larger, click the text and you’ll be able to adjust the color. (Bonus tip: After you’re done, pinch your text on the snap to make larger or smaller). Use the emoji keyboard when typing on your snap to add emoticons. Once you’re done, click the text icon in the top right corner a second time to make your emoji larger. You can then drag the emoji around your snap canvas, and make the emoji larger or smaller by pinching your screen. Use these tips and tricks to improve your content on Snapchat and you’ll be sure to stand out from the crowd. Again if you’re not using Snapchat to communicate with millennial yet – now is the time!